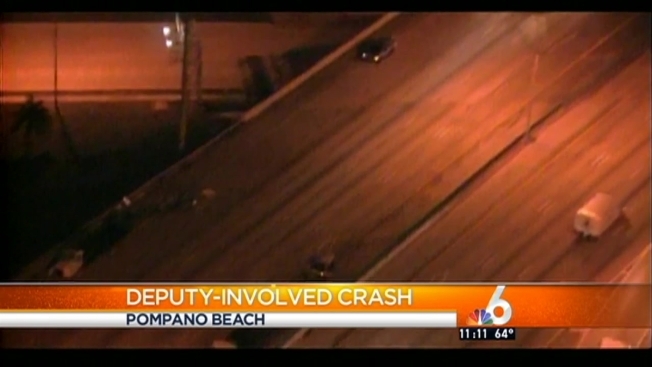 A Broward Sheriff's Office deputy was involved in a car crash early Monday morning near Pompano Beach. According to BSO, Sgt. Brian Miller was headed southbound on I-95 in an unmarked BSO unit when he struck a Honda Civic that was stopped in the HOV lane, just south of Copans Road around 4:10 a.m.
Sgt. Miller, along with two adults in the other vehicle, were taken to Broward Health North hospital. Their injuries are non-life threatening. It is not known why the Honda, driven by 29-year-old John Lewis of Coral Springs, was stopped in the HOV lane without any warning lights activated. Sgt. Miller is a 29-year veteran with BSO.